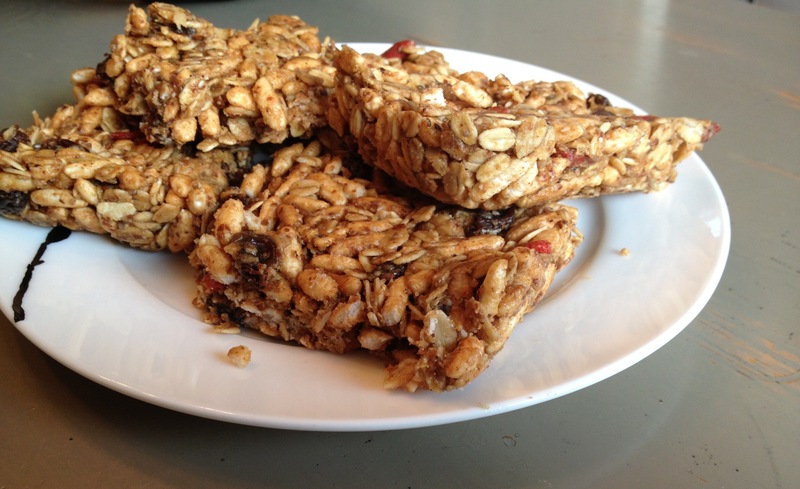 Looking for a good breakfast bar? Or post workout snack? This is pretty much a good anytime bar. These babies will give you your punch of protein without any of that meat nonsense people think they need for muscle repair. 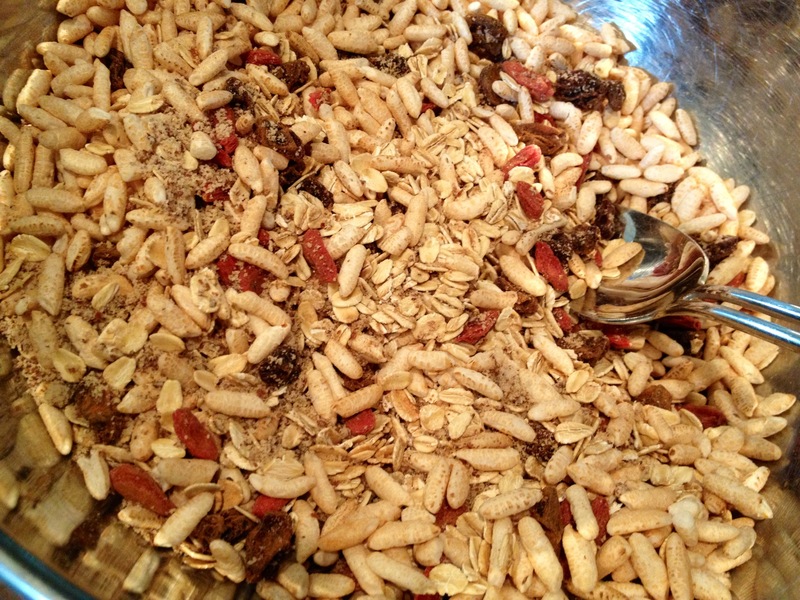 Whisk together the Brown Rice Cereal, oats, raisins, gogi berries, almond meal, cinnamon, and nutmeg in a large bowl. In a medium saucepan, heat the honey and brown sugar over medium-low heat. Stir frequently until the sugar dissolves. Add the peanut butter into the honey mixture while still over the heat. Stir until completely combined. Next, stir in the vanilla and salt. Mix contents of saucepan into the dry ingredients. Using a rubber spatula, stir the ingredients together until the dry ingredients are mixed into the peanut butter mixture. Press the mixture firmly into a 9×13-inch pan, (using your fingertips.) Chill in the refrigerator. Cut into squares. Devour. A life changing kitchen contraption. 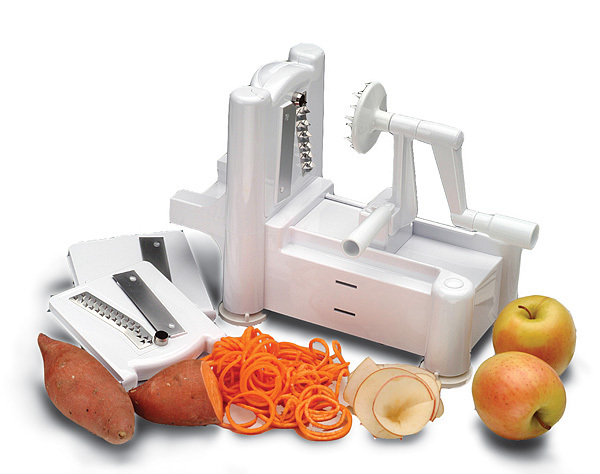 Do you know what a spiralizer is?? It makes noodles from produce. This particular post will target zucchini because as usual, thanks to my CSA, I have an overabundance of zucchini. I am a fan of putting it in my baked goods, but frankly I am feeling less than inspired by the banana/zucchini muffins I have inundated my family with. Enough’s enough. In comes the spiralizer. I actually bought this about a year and a half ago and the poor little guy has been sitting in its package. Finally pulled it out and it is so easy that I convinced my neighbors to buy one. This thing is awesome and for about $30 it can change your kitchen and health. This recipe is fab. Promise. It originated from fatfreevegan with a few minor tweaks. This recipe alone will make the spiralizer worth the money. I doubled the ingredients and am certain I should have tripled it. We were scraping the bowl and fighting over garbanzos. Not good. Wash the zucchini well and trim off their ends. Use a spiralizer to turn the zucchini into “noodles.” Line a large serving bowl with paper towels or a clean tea towel. Place the zucchini noodles in the bowl along with the red bell pepper. In a small bowl, whisk the peanut butter with 1 tablespoon of water and all remaining ingredients. If the mixture is hard to combine, add another tablespoon of water, but be careful not to make the sauce too runny. Remove the towels from under the zucchini noodles. Add the sauce and stir well to coat the noodles completely. Blend in the garbanzo beans. Although using zucchini instead of spaghetti doesn’t sound super exciting for the taste buds, this recipe will change your mind. It is fantastic and bursting with flavor. Besides… who can stand another zucchini bread.